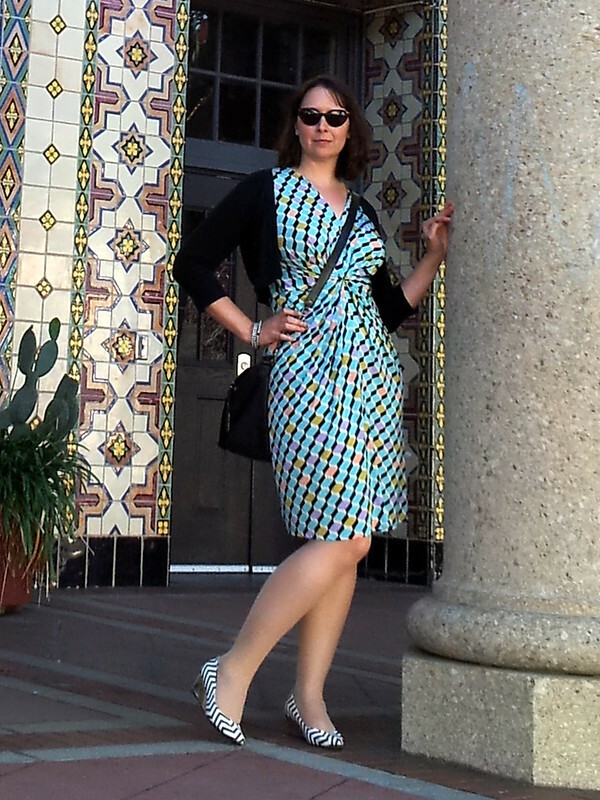 kate à la mode – fabulousness with a scoop of fun! I have a special fondness for tiles, too. And this building had some particularly lovely ones. Can you believe this is a public middle school?!? Quick follow-up to yesterday’s reblog of ModCloth’s post… I noticed on the MediaRun site that they have an updated version of the Oscar dresses infographic. The original plan was always to release a second version of this infographic, adding the newest dress from Sunday’s Awards. The scale of the response has instead enabled us to find many more dress designer names (thanks, Bob Mackie for contacting us about Sally Field’s dress), correct a few minor errors and go to print. Oscar Dresses: Every Dress Worn by Best Actress Academy Award Winners. Copyright Mediarun Digital 2014. I’ll be keeping my eye out for the poster version to hang on my wall! But this blog post is really about the outfit I’m wearing under the coat. See, when I got up in the morning I was at a loss for what to wear. 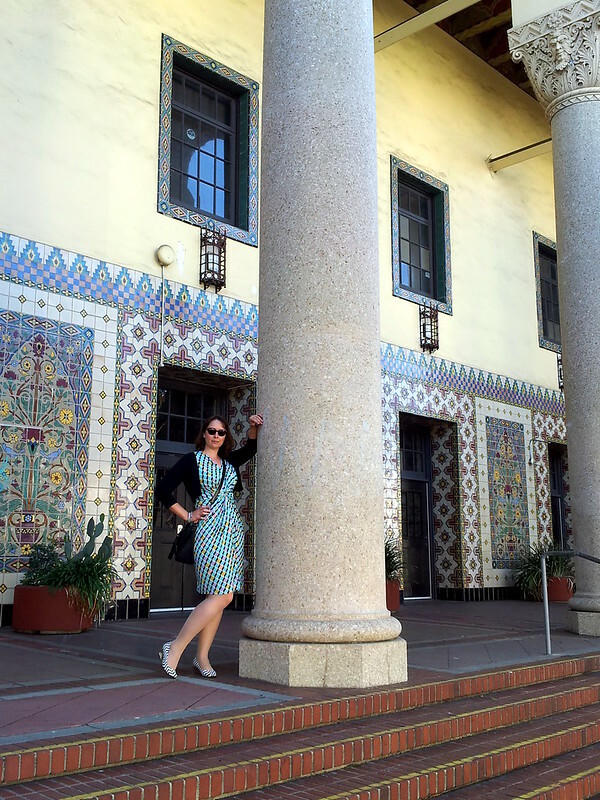 And then I perused ModCloth’s Style Gallery (one of my fave places for outfit inspiration), and was inspired by some great looks from fabulous gals like . . .
Jana G. (left) of Small Town, Big Smile! who added spice to a mint dress with a red belt and cardigan. 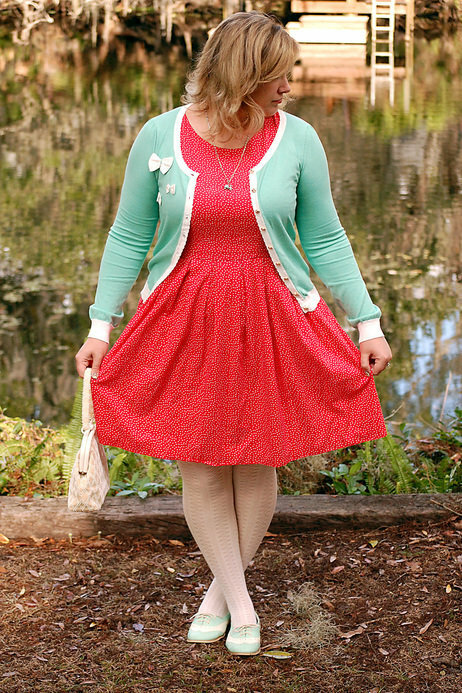 And Ashley R. (right) of Not Your Average Ashley, who paired a red polka dot dress with a sweet mint cardigan. But some of the other outfits that caught my eye incorporated lovely shades of aqua instead. 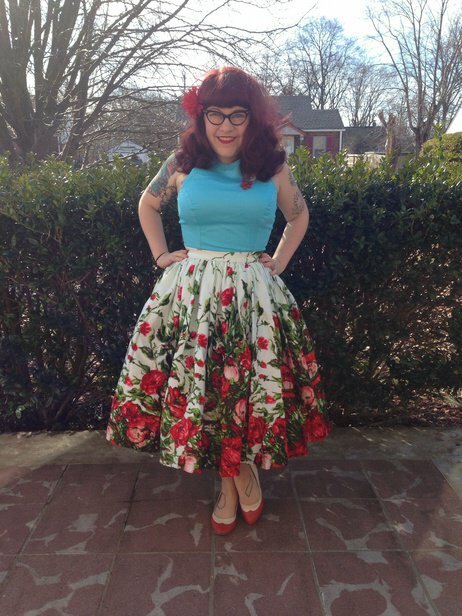 Like the outfit posted by Amanda L. (left) of Modern June Cleaver. And the one posted by Katie M. (right), a.k.a. Amelia Jetson. And I happened to have bought a charming aqua dress recently – it was sitting in my closet, just waiting for the inspiration to wear it! P.S. You can see more of my favorite Style Gallery photos here! 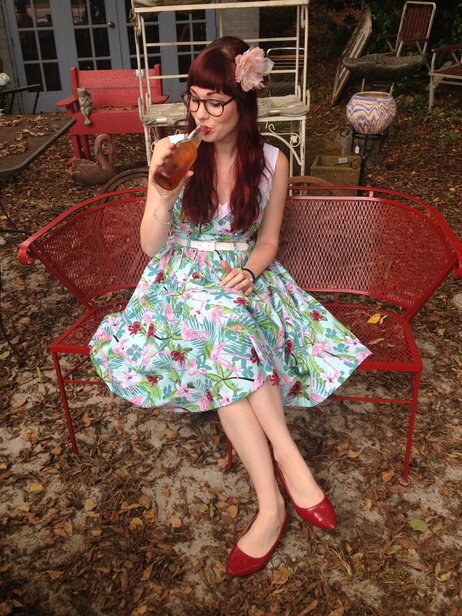 I don’t talk much about my day-to-day job at ModCloth on this here blog. I guess my love of ModCloth’s clothes is obvious, and I love/hate that I have an employee discount that encourages me to fill my closet to the brim. But what I’m truly thankful for is that I’m doing work I enjoy, for a customer-centric company with a truly awesome community of customers. 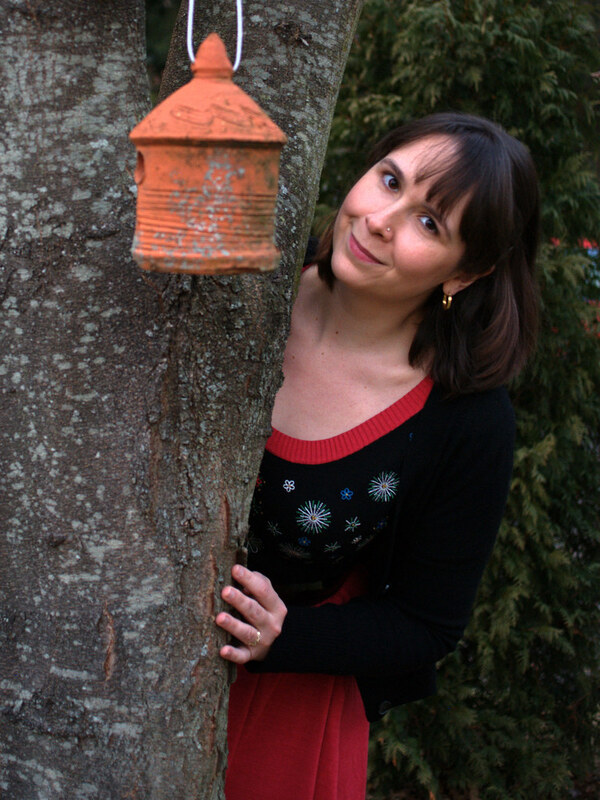 Before ModCloth, I was a grad student studying psychology & behavioral decision research. Basically, I was looking into why people make the decisions they do and what affects their judgments. I’m still passionate about that area of study, but academia can be rather isolating, and I often felt like I was floundering with no real impact on the world around me. Fast-forward to today, and I’m still studying psychology & decision making – but in an applied way, with a collaborative team of coworkers. 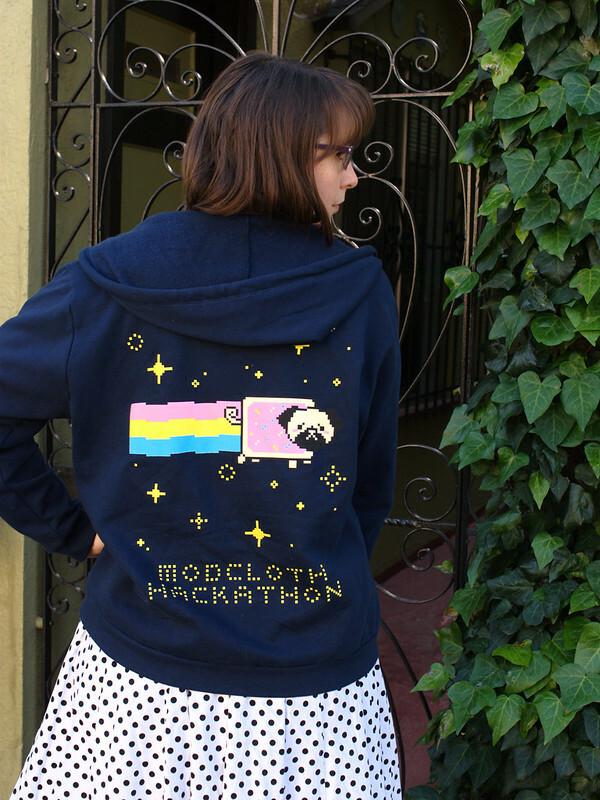 And then, once or twice a year, I get to play in ModCloth’s hackathons. Our hackathons include a mix of people who work on website & app development, user experience, analytics & customer research, along with colleagues from other parts of the business (like marketing and buying/merchandising). We form small teams and spend 3 days building a new feature or proof of concept. 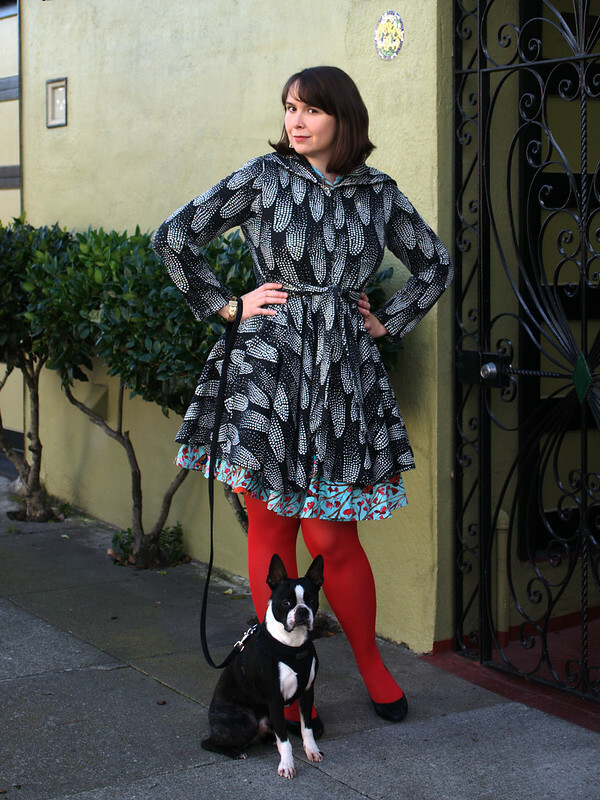 The goal is to spark creativity and build something to enhance the ModCloth user experience. Last year, for example, a team developed a prototype that became “Fit for Me” – a feature on the ModCloth iPhone app that enables customers to browse products based on their measurements. As for my team’s hackathon project – we’re working on getting it implemented, so it’s still under wraps for now. But I’ll let y’all know if it goes live! For Christmas this year I visited my family in Pennsylvania. Yep, for 5 days I gave up the perfectly mild San Francisco weather for the bitter, blustery cold of the Northeast. Except it wasn’t that bad. We got just a sprinkling of snow on Christmas eve and a light flurry on the day after Christmas. But still, I needed to bundle up a tiny bit with a merino wool cardigan (an old standby from Banana Republic) and super thick, fleece-lined tights that I picked up from Nordstrom Rack last year. 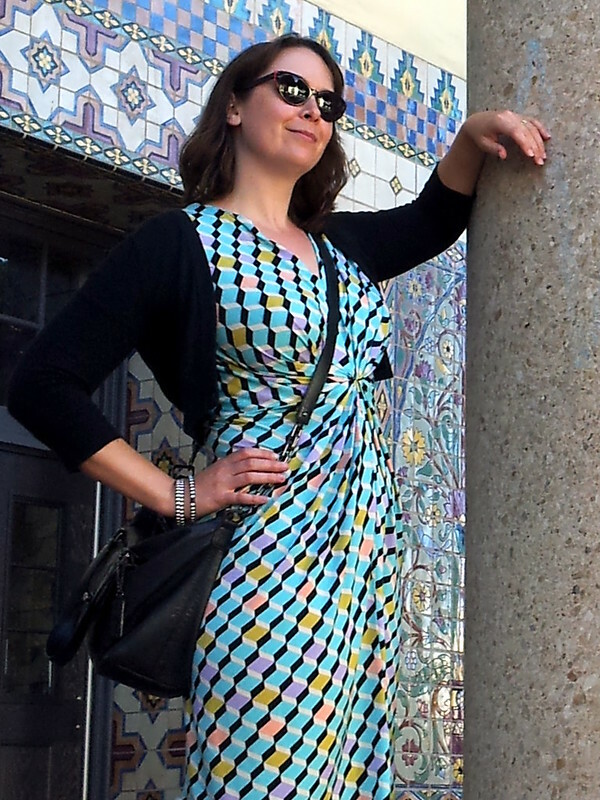 Plus, it was the perfect opportunity to wear the sweater dress that I recently picked up at ModCloth’s internal sample sale! The dress was actually about 2 sizes too large, but after I cut about 8″ from the waist and sewed it back up it fit quite well. And it’s super-dooper comfy to boot! Hope you all had lovely holidays, and best wishes for 2014! Black and white and dogs all over! When Pat saw me take this sweater out of my latest ModCloth box, he said, “I can’t believe you bought that!” But how could he believe I wouldn’t buy it?! 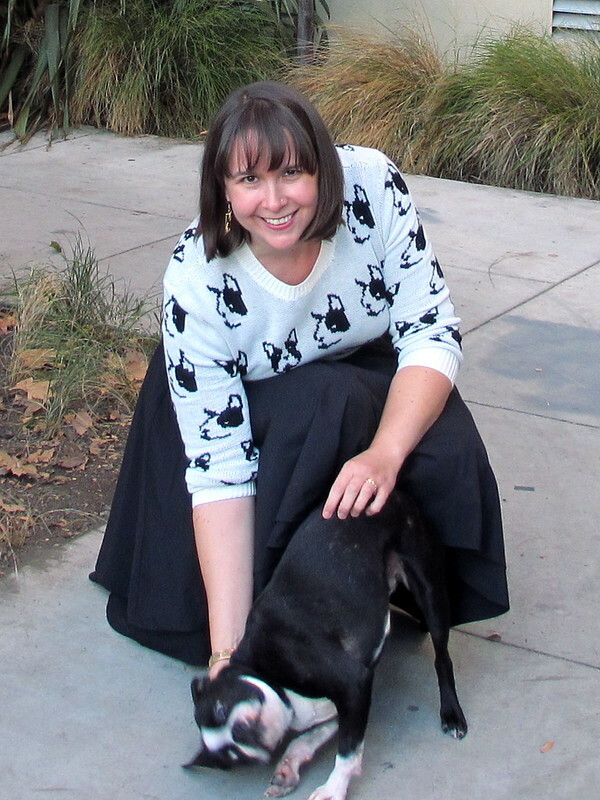 I mean, it’s covered in Boston Terriers! And Rocky completely supported my decision. 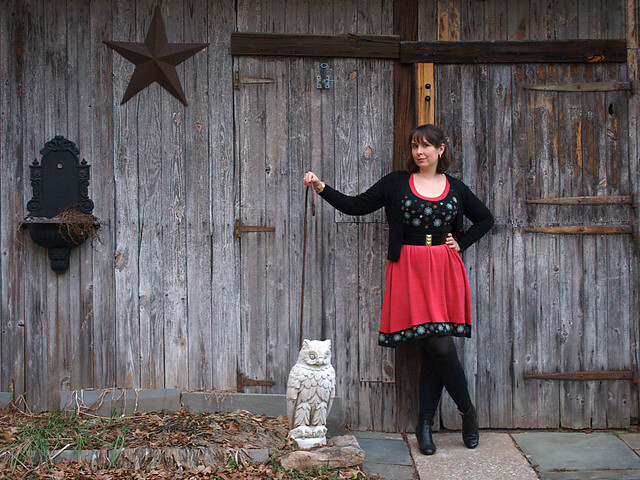 As I’m wont to do, I paired the sweater with one of my go-to skirts and my red Calderon belt. Black fishnets layered over red tights completed the ensemble. 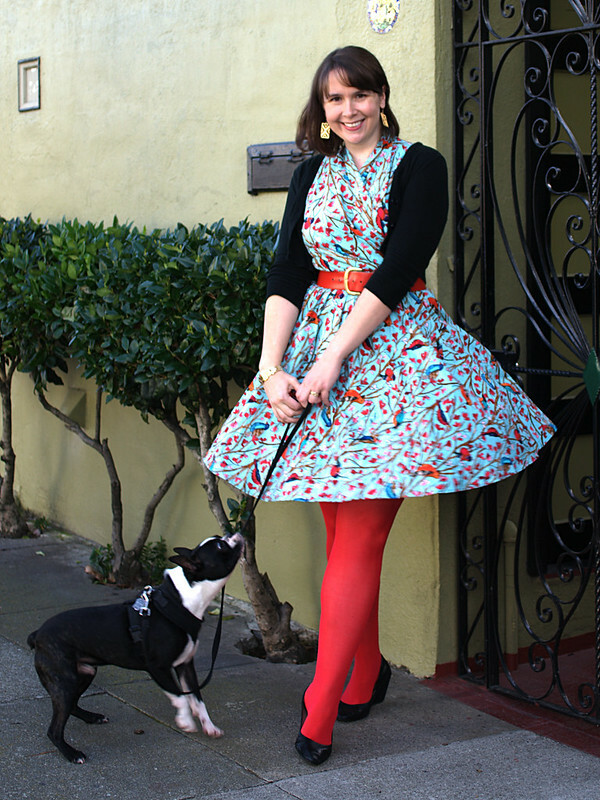 Perfect for a day at the ModCloth office, with Rocky by my side!